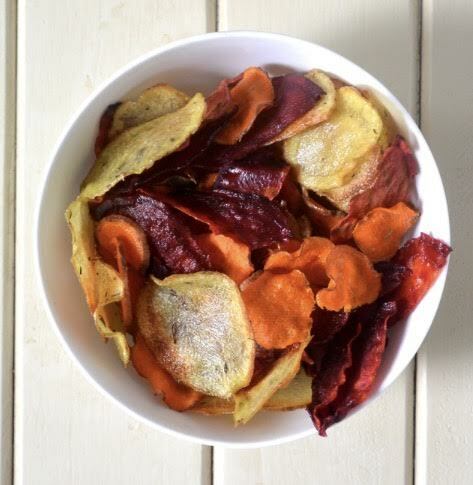 You are at:Home»Grub»Day 19 and we have a root vegetable chip recipe for the weekend!! Kids and adults will indulge in this healthy snack. Try alternating the spices as well by using cinnamon, cumin, dried oregano, or dried thyme. Preheat oven to 225. Place an oven safe rack over a large sheet pan. Using a mandolins or sharp knife, slice each vegetable into paper thin rounds and lay in single layer on the rack. Drizzle olive oil on veggies and bake until crisp (about 1.5 hours). 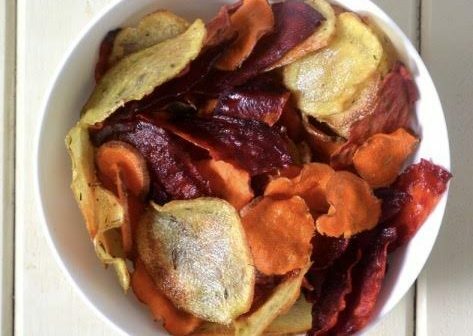 Remove from oven and toss chips in bowl with course salt, garlic powder, and cayenne. Avoid Drinking Your Meals Although smoothies are technically allowed, I am not a fan of drinking calories. Science shows that your brain’s normal satiety signals are bypassed when you gulp instead of chew. This means, people don’t account for those calories later in the day, and end up eating more. Do yourself a favor, wake up five minutes earlier and make yourself some eggs or reheat some leftovers instead of bringing a smoothie along for your commute.